There were some significant papers this year. There was a proposal to elevate Marmorkrebs to its own species. Part of this included deposition of reference specimens in a museum, which should be a useful long-term resource, regardless of whether the community moves to the proposed new species name, Procambarus virginalis. 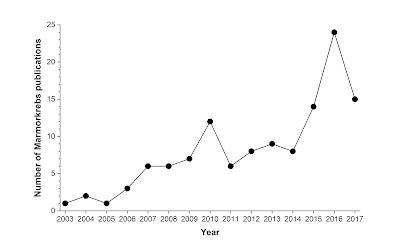 The number of introduced populations continued to increase, with more reports in the scientific literature of European locations and newspaper reports of more discoveries in Japan. The overall trendline still shows no sign of flattening. The crayfish is widely accepted as very sensitive and fast bio-indicator of changes in water quality. Studies based on heart beat analysis demonstrated the potential of using crayfish as a detector of pollutants consequently several computer-aided systems were developed to use this mechanism. The main complication with applying such a system is the necessity of using metal wires or optical fibres to transmit the signal from sensor which is placed on back of the crayfish to the processing hardware; these attachments restrict system design to one crayfish in one aquarium. We introduced an original system for crayfish heart beat monitoring based on completely non-invasive/contactless hardware. The system can determine crayfish heart beat frequency using only the combination of near infra-red (NIR) illuminator and sensitive camera. The heart rate is the only parameter needed in most of the studies using crayfish as a bio-indicator. We developed the system which needs no attachment, so more crayfish in one aquarium can be monitored simultaneously and it provides accurate information on heart rate and crayfish need no adaptation to the system. It can be used as equivalent to existing systems to simplify the crayfish studies. Nonconsumptive predator-driven mortality (NCM), defined as prey mortality due to predation that does not result in prey consumption, is an underestimated component of predator-prey interactions with possible implications for population dynamics and ecosystem functioning. However, the biotic and abiotic factors influencing this mortality component remain largely unexplored, leaving a gap in our understanding of the impacts of environmental change on ecological communities. We investigated the effects of temperature, prey density, and predator diversity and density on NCM in an aquatic food web module composed of dragonfly larvae (Aeshna cyanea) and marbled crayfish (Procambarus fallax f. virginalis) preying on common carp (Cyprinus carpio) fry. We found that NCM increased with prey density and depended on the functional diversity and density of the predator community. Warming significantly reduced NCM only in the dragonfly larvae but the magnitude depended on dragonfly larvae density. Our results indicate that energy transfer across trophic levels is more efficient due to lower NCM in functionally diverse predator communities, at lower resource densities and at higher temperatures. This suggests that environmental changes such as climate warming and reduced resource availability could increase the efficiency of energy transfer in food webs only if functionally diverse predator communities are conserved. Male sexual differentiation in crustaceans is controlled by the androgenic gland (AG), a unique male endocrine organ that, in decapods, is located at the base of the 5th pereiopod. In these animals, the insulin-like androgenic gland hormone (IAG) is the major factor secreted from the AG to induce masculinization and maintain male characteristics. It has, however, recently been proposed that this hormone also plays a role in growth and ovarian development in females. In this study, we tested such a possibility by searching for the IAG gene in the marbled crayfish, a parthenogenetic animal that reproduces asexually to form an all-female genetic clone. Based on the phylogenetic relationship between the marbled crayfish and Procambarus fallax, a gonochoristic species of the same North American Cambaridae family, we searched for the IAG gene in the marbled crayfish and then fully sequenced it. The open reading frame of the gene was found to be completely identical in the two species, and their introns shared over 94% identity. It was also found that, in addition to its expression at the base of the 5th pereiopod and in the testes of male P. fallax crayfish, IAG was expressed in the muscle tissue of P. fallax males and females and even of the parthenogenetic marbled crayfish. These findings provide new insight into possible functions of IAG, in addition to its role as a masculinization-inducing factor, and also constitute the basis for a discussion of the evolutionary relationship between the above two species. The eastern US is the plce to be for crustacean research next year. It will not only host the International Crustacean Congress in Washington, it will be hosting the next Astacology meeting in Pittsburgh. Mark your calendars for 9-13 July 2018! Marbled crayfish are a globally expanding population of parthenogenetically reproducing freshwater decapods. They are closely related to the sexually reproducing slough crayfish, Procambarus fallax, which is native to the southeastern United States. Previous studies have shown that marbled crayfish are morphologically very similar to P. fallax. However, different fitness traits, reproductive incompatibility and substantial genetic differences suggest that the marbled crayfish should be considered an independent species. This article provides its formal description and scientific name, Procambarus virginalis sp. nov.
Due to the fact that marbled crayfish (Marmorkrebs) got into the reservoirs of the Dnipropetrovsk region in 2015, it was necessary to study the possibilities of its adaptation to environmental factors of reservoirs for further prediction of its distribution or even acclimatization under conditions of toxicological contamination of the ponds of the steppe Prydniprovya. The article presents the results of studies on the influence of heavy metal ions on marbled crayfish. It was determined that zinc and cadmium ions affect weight indicators, survival and reproduction of experimental crayfish. Experimentally simulated concentrations of heavy metals on the example of zinc – 0.1 mg/l (10 MPC) and cadmium – 0.01 mg/l (2 MPC) allowed detecting the reaction of the excretory system of marbled crayfish. It is determined that under the influence of heavy metal ions the area of glandulocytes cells decreases by 10.4–14.8%. Also, there is a decrease in the cellular nucleus, thus, under the influence of zinc, the nucleus of the secretory cells was 23.6% smaller, and under the influence of cadmium by 17.5%. To study the influence of zinc and cadmium on the glandular cells of the green gland of marbled crayfish, the index of nuclear-cytoplasmic ratio (NCR) was used. The indicator of nuclear-cytoplasmic ratio allows estimating the level of metabolism and detecting the manifestation of compensatory reactions of the organism of experimental crayfish. The value of NCR in the experiment and control was not statistically different and ranged from 0.29 to 0.31 units. This indicates an interproportional reduction in both the cytoplasm of the cells of the green gland and their nuclei, caused by heavy metals exposure. The negative influence of heavy metals on the histostructure of hepatopancreas of marbled crayfish was determined; significant changes in the structure of tissue were noted, heavy metals influenced the shape of the hepatopancerase lobes and the size of the lumen. The worst histological picture of cells of experimental tissues and organs of marbled crayfish was observed in individuals exposed to cadmium ions due to the toxicological effects of this heavy metal. Investigation of the histological structure of tissues and organs of marbled crayfish will allow the development of measures for the determination of biomarkers for the bioindication of the aquatic environment using freshwater crayfish. The results of such studies have an important fundamental and applied significance for understanding the mechanisms of adaptation of crustaceans to the conditions of toxicological burden on aquatic ecosystems. 1. 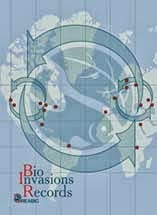 The likelihood and impacts of invasions by novel organisms (e.g. non-native species, genetically-modified organisms) on the composition and functioning of receiving biological communities hinges on their capacity to exploit resources and/or avoid predation relative to resident counterparts. While assessment of invasion risk based on the comparison of functional responses (per-capita consumption rate as a function of resource density) of novel species with native analogues has been gaining popularity, it may be undermined if alternative prey and potential predators are not represented realistically. 2. Here, we propose a conceptual framework that enables rigorous identification of trophic traits conducive to invasion success by novel organisms – irrespective of their trophic position – and their likely ecological impacts, given their arrival and establishment. We focus on consumption here, but our framework can also be used for autotrophic energy acquisition, and extended to non-trophic and indirect interactions. 3. The framework enables a structured and prioritised selection of subsets of trophic links for invasion risk assessment. It is based on foraging theory and advances in comparative functional responses in invasion ecology. It can even be used in the absence of a resident comparator organism and when resources or predators are only partly known. 4. 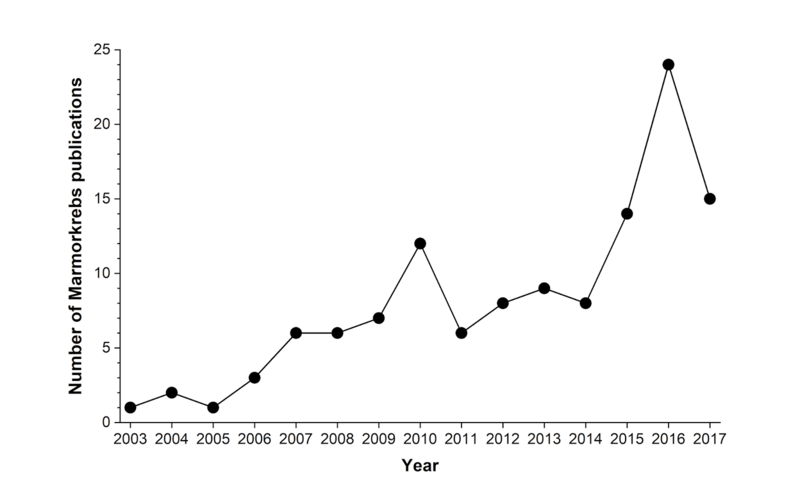 Our approach enhances the predictive power of species screening, and thus advances prevention and management of invasions under a common framework for all types of novel organisms. The marbled crayfish, Procambarus fallax f. virginialis, is an obligate parthenogenetic crayfish species, its spread in the wild being linked to the aquarium pet-trade. Forty-two adult individuals were found for the first time in Romania in the semi-natural ponds in Băile Felix, near Oradea. Nine ovigerous females were captured as evidence that the population is breeding in the wild. They probably originated from the pet trade and were released by hobbyists into the pond. Microsatellite analysis revealed the same allelic patterns as in a previous study, confirming that these marbled crayfish are parthenogenetic and originate from a single individual. The crayfish plague pathogen Aphanomyces astaci was not present in the population. The site inhabited by this established marbled crayfish population is supplied with water by thermal underground streams, ensuring a constant high temperature. The nearby Peța Natural Reserve protects several endemic species that could be threatened by the further range extension of marbled crayfish. Special protection measures are therefore urgently needed.